The magnetic chips used by the Glancetron 1300 - also called Dallas chips - have been standard in many POS systems for many years. Naturally, our system also uses these fast and easily operated chips. The keys just have to be placed on the lock and remain magnetically attached. 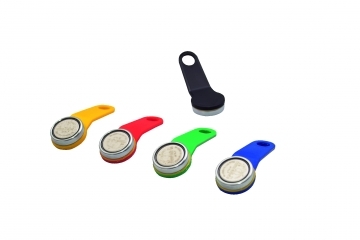 For restaurant personnel this easy-to-use magnetic chip technology is especially convenient and fast at peak hours, as unlike with plug systems, it is irrelevant how the chip is placed on or removed from the lock. All key chips are plastic and weigh only several grams. A hole is provided to attach the chip to key rings, chains or similar accessories. The key chips are available in red, blue, green, yellow, and black. Every chip contains a random character string that is factory-set. To provide sufficient protection against manipulation the key strings cannot be changed by the user.